Crystal McCrary, author, producer and reception co-host; Sandra L. Richards, author of Rice & Rocks; and Kimberely Hatchett, private wealth advisor and co-host. During the writing process I thought about how Rice & Rocks can serve as an educational resource for families seeking to teach children the importance of cultural diversity. 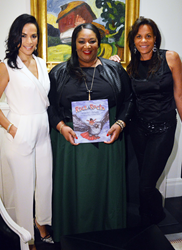 On Thursday, some of New York’s elite gathered together in New York City to celebrate the release of Rice & Rocks, a new children’s book written by Sandra L. Richards that connects cultures through cuisine. Hosted by Crystal McCrary, CEO of CM Productions, a television and film Production Company, and Kimberely Hatchett, an Executive Director, Private Wealth Advisor at Morgan Stanley, the private reception attracted a wide-range of film, fashion, art and finance notables to celebrate Sandra’s debut as a children’s author and her commitment to Rice & Rocks benefiting children’s literacy worldwide. During the book’s pre-order campaign and since its debut in August, Sandra pledged to donate one book for every five books sold to support programs that highlight the importance of children reading. To date, Sandra has donated 175 books across the country. In attendance at the reception were: actor and activist Hill Harper; Supermodel and entrepreneur, Veronica Webb; Studio Museum in Harlem’s Director and Chief Curator, Thelma Golden; Celebrity Fashion Stylist, June Ambrose; renowned wellness specialist and maternity lifestyle maven, Latham Thomas; owner and chef of Minton’s and The Cecil restaurants, Alexander Smalls; Broadway producer Alia Jones-Harvey; TV news personality Lola Ogunnaike; social commentator Sunny Hostin, amongst others. “I started off writing a book in honor of my nephew, Giovanni, who passed away at the age of eight in 2007,” Sandra shared. “I wanted to have a way of remembering how fun and happy he was while with us. And during the writing process I thought about how Rice & Rocks can serve as an educational resources for families seeking to teach children the importance of cultural diversity. I wanted a book that was relatable and bought people together as we are this evening,” she said. In the book, readers meet Giovanni before his friends come over and he finds out his grandmother is serving rice and beans, a traditional Jamaican side dish. Giovanni is embarrassed—he does not like rice and beans, calling them “rice and rocks” and worries his friends will think the dish is weird. So his favorite Auntie comes to the rescue. She and Giovanni’s pet parrot, Jasper, take him on a magical journey across the globe, visiting Japan, Puerto Rico and New Orleans, to learn about similar foods to his family’s Sunday meal each place offers. Guests received a complimentary signed copy of Rice & Rocks, which is described as "A beautiful, amusing tribute to family traditions,” by the Kirkus Reviews. And currently has a five-star rating on Amazon.com. Sandra is the Executive Director, Head of Business Development and Segment Marketing, Wealth Management at Morgan Stanley. She currently serves on the Morgan Stanley Wealth Management Diversity & Inclusion Council and as a Co-Chair of the Wealth Management Multicultural Employee Networking Group. Rice & Rocks ($17.99, Wise Ink Creative Publishing) is available for purchase on Amazon, BN, Books A Million or your favorite local independent bookstore. For more information on Rice & Rocks, please contact Marcia Cole or Keith Forest of Ivy Digital at 646.845.9874 or mcole(at)ivydigitalllc(dot)com or KForest(at)ivydigitalllc(dot)com. 1. Crystal McCrary, author, producer and reception co-host; Sandra L. Richards, author of Rice & Rocks; and Kimberely Hatchett, private wealth advisor and co-host. 2. Megan Kayleigh Sullivan, illustrator of Rice & Rocks with Sandra L. Richards, author of Rice & Rocks. 3. Rice & Rocks on display at the private reception. 4. June Ambrose, celebrity stylist; Crystal McCrary, co-host; Sandra L. Richards, author of Rice & Rocks; Kimberely Hatchett, co-host; Thelma Golden, Director and Chief Curator at Studio Museum in Harlem. 5. Veronica Webb, Supermodel and Sandra L. Richards, author of Rice & Rocks. 6. Sandra L. Richards, author of Rice & Rocks with Latham Thomas, celebrity Doula and author. 7. Crystal McCrary, co-host with Gaye Anderson, a guest. 8. Veronica Webb, Supermodel; Sandra L. Richards, Rice & Rocks and Gil Robertson, President of African American Film Critics Association. 9. Sandra L. Richards, author of Rice & Rocks with S.Tia Brown, Lifestyle Editor of Ebony magazine. 10. Sandra L. Richards and Hill Harper, actor and activist. 11. Crystal L. McCrary and Hill Harper, actor and activist. 12. Alexander Smalls, owner and chef of Minton’s and The Cecil restaurants in Harlem, Sandra L. Richards and Rita Ewing, author and owner of Massage Envy Spa Midtown West.